Getting your custom motorcycle on Pipeburn isn’t too difficult. All you need to do is provide good quality, clear photographs and a few hundred words about yourself and the bike. This will get edited into something a little more readable for you, our appreciative audience. 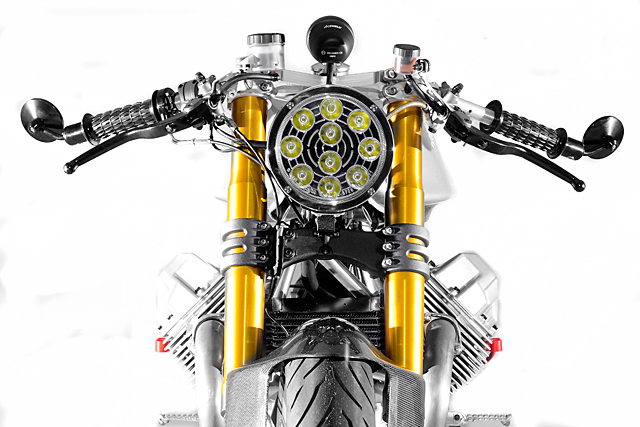 The details from bike builders vary. Sometimes we get beautifully poetic prose, sometimes we get a surfeit of detail about the minutiae of the build. And other times we get a few lonely lines of broken English with only the most basic details, leaving us struggling to make up the word count. 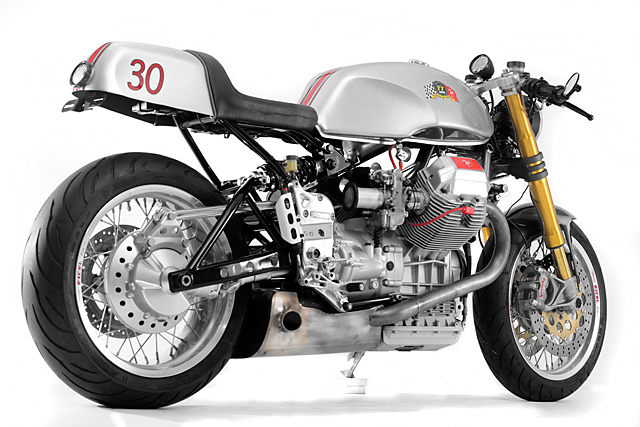 That’s what we got when we were sent photos of Santiago Choppers’ 2000 Moto Guzzi V11 Sport. Thankfully, in this case, the pictures really are worth a thousand words. Santiago Choppers is headed by the enigmatic Alain Bernard, man of few words and much fabrication. Working on bikes since the age of fourteen, his workshop is one of the go-to points for all manner of unusual custom Harley Davidson parts. While trike and chopper conversions are their bread and butter, in more recent years they’ve been producing a few café racers, most notably building ‘Norley’ kits for Sportsters. 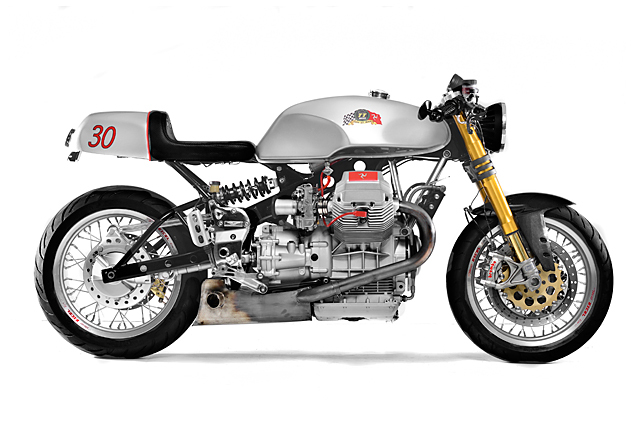 Now, aside from that backstory there’s not much to go on with this V11, but a considerable amount of work has gone into crafting the Guzzi’s original, bulbous lines into something as stripped back and mean looking as this. 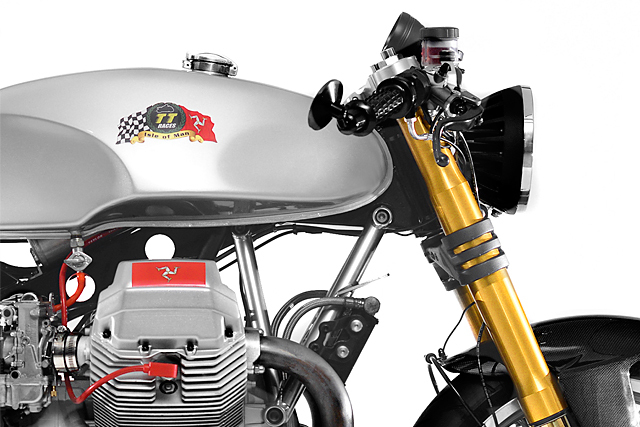 One of the most important changes is the tank, which appears to have been taken from an earlier model V11 sport (scalloped out for the half fairing) and modified with a Monza gas tap. The older model fuel tank means this Guzzi now runs traditional 40mm Mikuni carburettors instead of the original fuel injection. 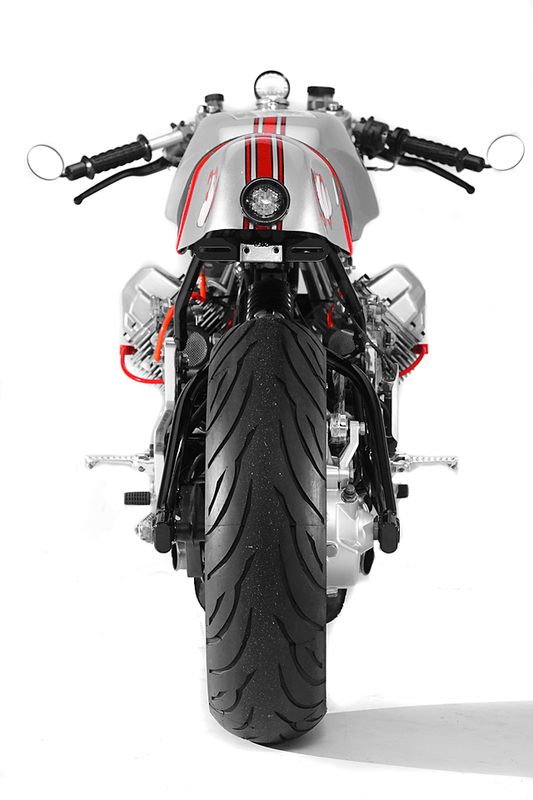 Down below, the engine breathes into a stainless steel exhaust that hugs the bottom of the frame and rear wheel neatly, looking more like something from a current factory build than anything out of the 1960’s. 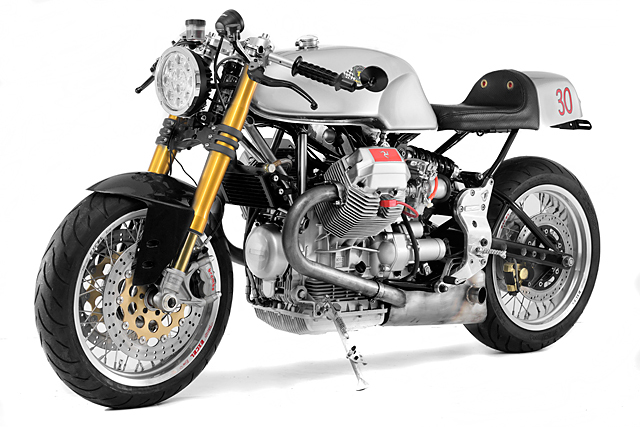 It’s a modern touch that stops a bike like this from descending into café racer tropes, with twin reverse megaphones being the go-to option for this kind of build. It’s the kind of detail that requires a keen eye and more than a little bit of chutzpah to pull off. In this case, it’s worked perfectly. 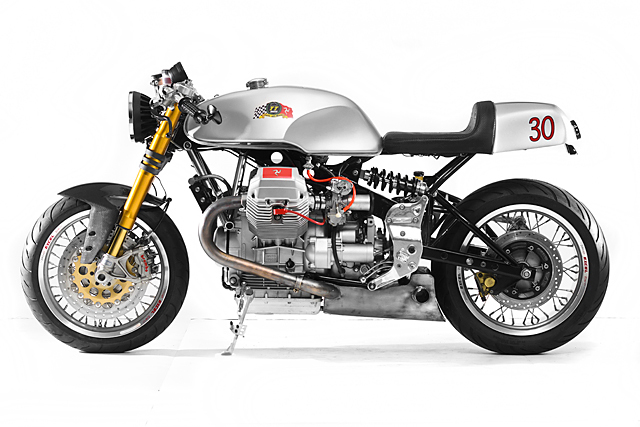 The suspension on the Guzzi is more traditional, with a Hagon shock absorber on the rear while the front forks are now an impressive pair of Ohlins, running twin 320mm rotors and another 320mm at the rear, mounted to a modified Moto Guzzi California hub. The wheels were laced and trued by Santiago choppers themselves, with excel rims mounting a 120/70×17 front and 160/70×17 rear. 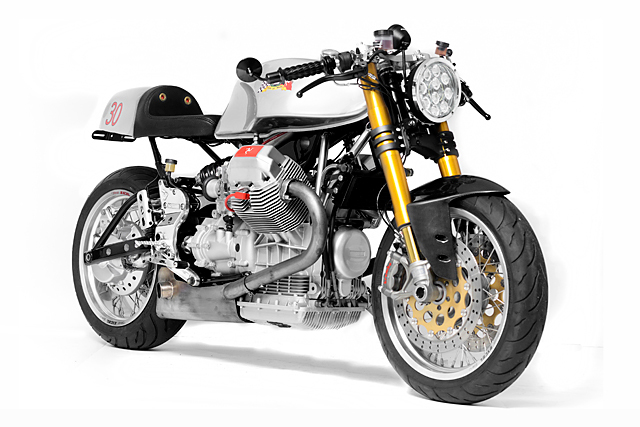 All these modifications, taking place over a four-month period, have managed to trim the Guzzi down from a hefty 221kg to only 168kg. All that torque in such a light package can only mean a hilariously fun bike to blast around on, and in its Isle of Man inspired livery it looks gorgeous too. It’s lighter, faster, and better looking than anything I’ve seen in a while. Really, the guys at Santiago Choppers didn’t have to say anything at all.